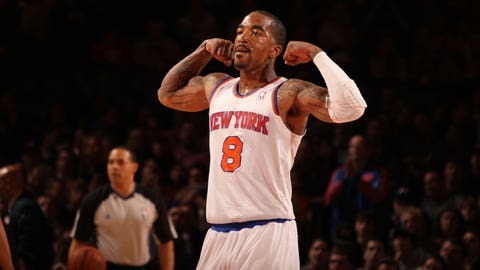 J.R. Smith was able to laugh off his poor shooting night vs. the Bucks. Sure, the Knicks can say "lol" now, but Wednesday night’s game — and J.R. Smith’s 5-for-17 effort from 3-point land — almost made their double-overtime win over the Bucks another example of New York’s futility in its 8-17 season. The Knicks eventually got the win in the second extra period (but only after Andrea Bargnani made the head-scratching decision to shoot the ball near the end of the first overtime when just holding it would have sealed the game for New York). The Knicks prevailed after Smith hit a go-ahead jumper to help wrap up the 107-101 win. The shot was a rare make for Smith on the night, though. He went just 7-for-23 from the field and was 5-for-17 on 3-pointers, making his 19 points low in efficiency and high in frustration. The good news, however, is that Smith knows he was a bit of a mess. Smith tweeted a response to his poor shooting night (followed by a helpful graph from ESPN’s Ian Begley of just where those shots were launched from). Lol 17 threes tho! Had to say damn my self! Smith wasn’t done then, though. But trust me give me that chance again I'll shoot it again! 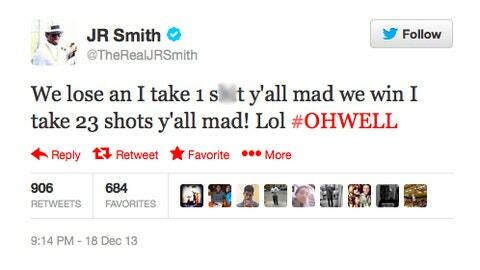 He also seemed irritated that people are paying attention to his shot totals (we think the blurred-out word was intended to be "shot," but his fingers made it less family-friendly). Well, at least it ended in a win. Lol.